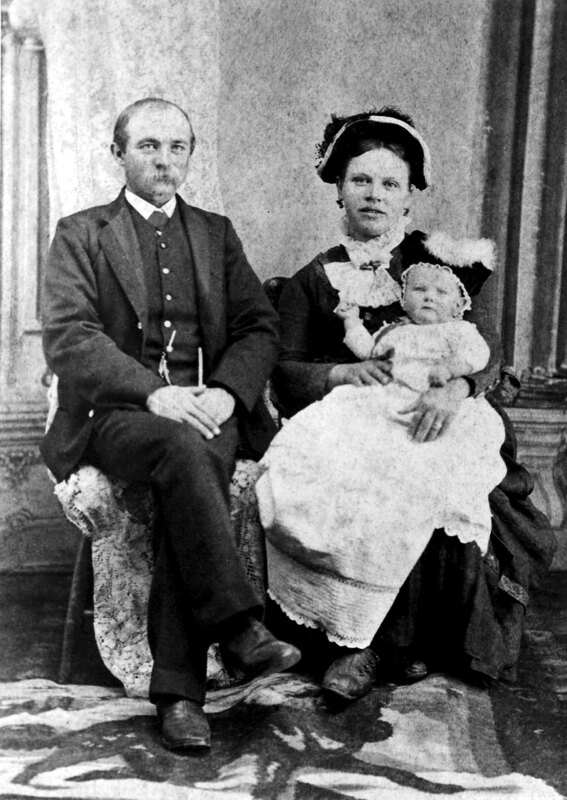 Anna Theresa Feldhaus Sutter, sister of Heny Bernard Feldhaus, Jr.
Joseph Sutter and Anna with their first born John about 1884. 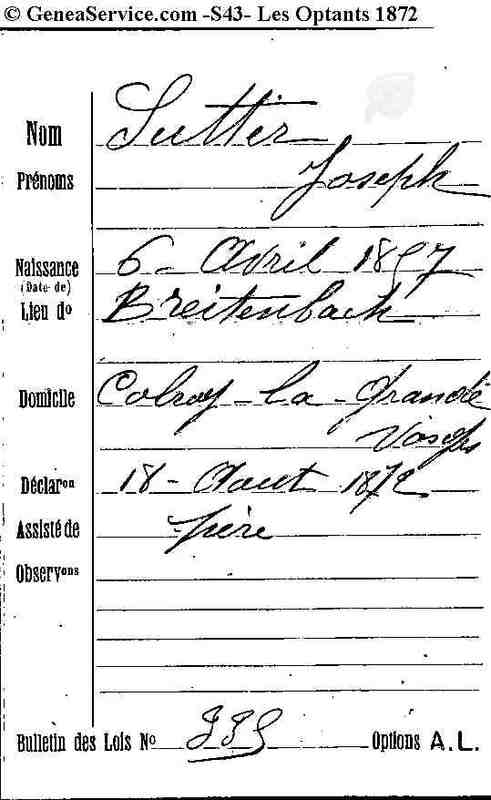 This is a declaration of French citizenship signed by Joseph Sutter in 1872 in Europe at age 15. Read the Description at the right for more information. Joseph Sutter arrived at the port of New York on 22 August 1877 at the age of 20 aboard the ship Amerique. The S/S Amerique was built in 1864 at St. Nazaire by Compagnie Gererale Transatiantique (French Line). 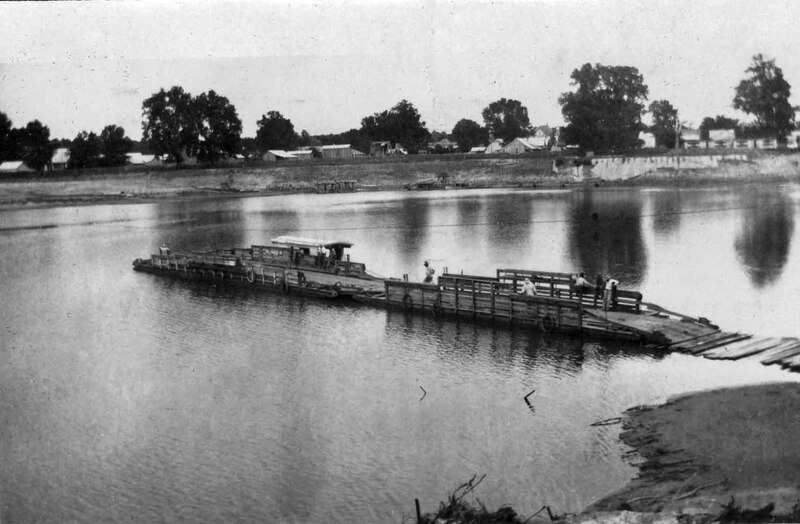 She was steam powered and, 44 feet by 355 feet, and weighed 320 gross tons. Joseph had left Alsace via the port of LeHavre, France and Portsmouth. Five years later he married Annie Feldhaus in Lawrenceburg TN. We really don't know much about Joseph or his family. 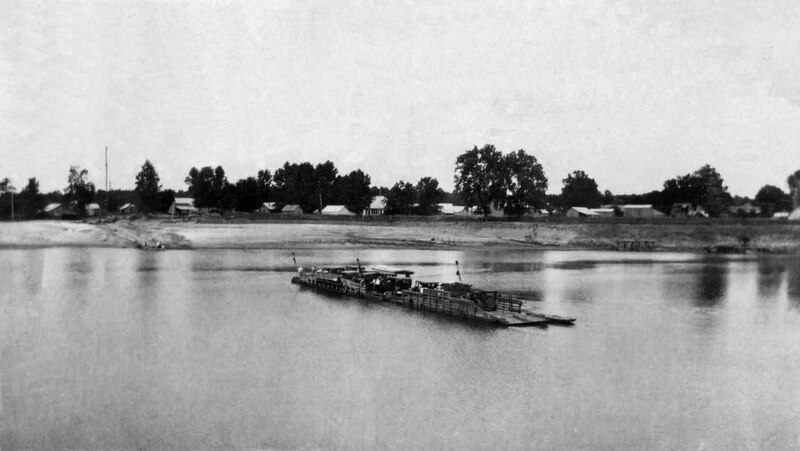 Below you can view several documents related to Joseph, including information about the ship he traveled on from Europe. Joseph is the ninth name from the top of the second page of the ship's manifest. Notice there is no other Sutter listed on the manifest calling into question the story below that he arrived in the US with a brother. Also below is a copy of Joseph and Annie's marriage license. The documents are best viewed by clicking on the "full screen" selection just below here and then increasing the size of the documents by clicking on the "Plus" button at the botton of the screen. When finished reading the doucments press the "escape (esc)" button on your keyboard to return to this page. Above is a picture of the Sutter family that I received from Robert Sutter, son of Henry and grandson of Joseph and Anna, on 1 Nov 2014. Above is a picture of Anna Feldhaus Sutter and her children listed left to right. Herman, John, Alfonso, Frank, Anna, Joe, Aloysious, Henry, Will. The family picture above came from Dorothy Blackwelder's son, Leon Blackwelder and was sent to me by Bob Sutter. I believe it was taken about 1934/1935, shortly before Anna Sutter died. These are Anna's children, their wives, and her grandchildren. Bob Sutter has identified those in the picture as follows. Back, left to right: Henry, Mary Ruth, Mary (Henry's wife), Betty Ann, John, Johnny, Bertha (John's wife), Josephine "Fina" (Herman's wife), Herman, Anna Feldhaus Sutter in the middle, Mary (Frank's wife), Frank, Bill, Walter, Louis, Alfonso, Joe. 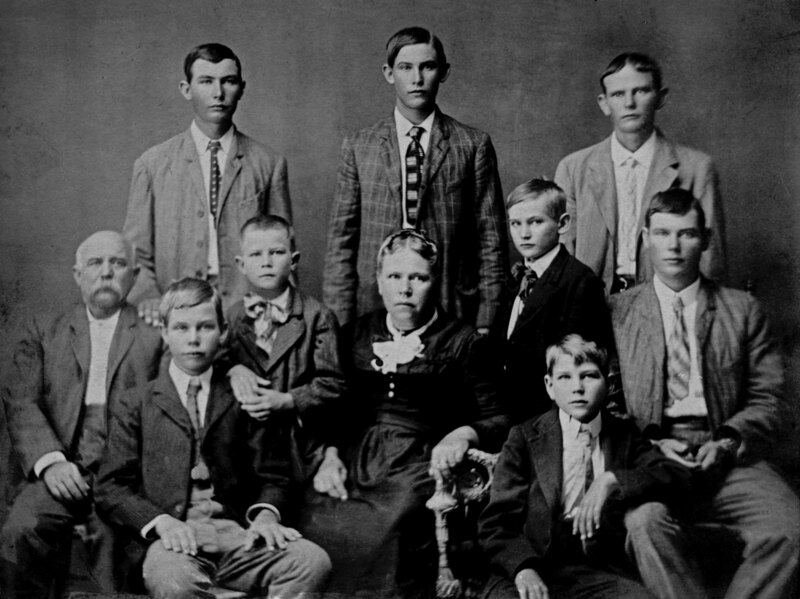 Front, left to right: Edward (John's son), Cornelius (Herman's daughter), Magdalen (John's daughter), Victoria (Herman's daughter), Bill (Henry's son), Katherine (John's daughter), Raymond (Frank's son), Vernon (Henry's son), Dorothy (Frank's daughter), Wilbert (John's son), Agnes (Herman's daughter), Harvey (Henry's son). Below is the 1900 Federal census for Lott, TX showing Joseph and Annie Sutter, their eight boys, and her parents. Margaret Hill told me on 4 Feb 2013 that the woman on the right of Annie is Francis Ascher, the mother of Frank Sutter's wife, Mary Stitz. Prepared by Terri and Glenn Blackwelder 1/16/94. Information obtained from Dorothy Blackwelder and others. These notes are presented just as they were prepared in 1994 without correction (for instance, it appears Joseph was a French citizen based on the document above) although some additional family facts have been added by me. -Henry Feldhaus (1818-1901) came from Germany with his wife, Catherine (1821-1901) to around Lawrenceburg, Tennessee. Her maiden name is unknown. 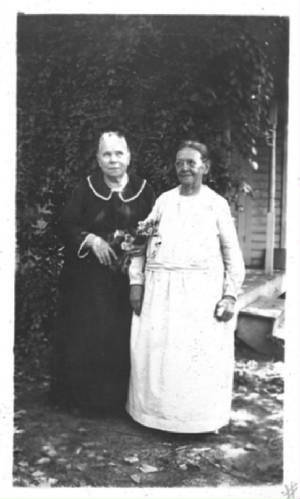 Their daughter, Anna Theresa Feldhaus Sutler (1859-1935) was 9 years old when they arrived in Tennessee from Germany in 1868. -Henry Feldhaus (1818-1901) was born in Germany, don't know where exactly. He was buried in the Westphalia. TX Catholic Cemetery. His wife, Catherine (1821-1901), was also born somewhere in Germany and buried with him. Catherine died on February 10, 1901 and her husband, Henry, died only 8 days later on February 18, 1901. -Anna Feldhaus Sutter (1859-1935) was also born somewhere in Germany. She is buried in Lott, TX at the Sacred Heart Catholic Cemetery. Her husband, Joseph Sutter (1857-1911), is buried at the Westphalia Catholic Cemetery. They were NOT buried together, since he died so much earlier. Plans were made to move him, but not carried out. -Anna Theresa Feldhaus (1859-1935) married Joseph Sutter (1857-1911). Joseph had emigrated from Germany to the USA from the Alsace Lorraine area in Europe (present: German/French border area) at age 18 or 19 to escape war there. Joseph came with one brother and they became separated and never found one another again. There is some speculation that that brother may have been involved in Sutter's Gold out in California during that period. Anna Theresa and Joseph spoke different German dialects and could not understand each other very well, so they just spoke English! Joseph Sutter (1857-1911). was a farmer in Falls County, TX, and was also a cotton farmer in South TX where the family lived for a time. After moving back to Falls County, he died at an early age, and the Sutter Brothers quit farming. Some stayed at Lott TX and some went to Cameron TX, all finding different occupations. John Sutter (1884-1954). Buried in the Cameron, TX St. Monica's Catholic Cemetery. Joseph Sutter (1885-1935). Buried in Lott, TX. Sacred Heart Catholic Cemetery. Melgior Sutter (1887-1888). Buried in Westphalia Catholic Cemetery, TX. William Sutter (1888-1954). Buried in Corpus Christi Catholic Cemetery. Frank Sutter (1890-1956). Buried in Pilot Point, TX St. Thomas Catholic Ceme:y.
Herman Sutler (1892-1965). Buried in Cameron, TX St Monica's Catholic Cemetery. Henry Alfons Sutter (1894-1895). Buried in Westphelia Catholic Cemetery. Infant. Anton Henry, Sutter (1895-1973). Buried in Irving Catholic Cemetery, TX. Alfons Sutter (1897-1954). Buried in Corpus Christi Catholic Cemetery, TX. Alois Sutter (1898-1958). Buried in Corpus Christi Catholic Cemetery, TX. Anna Marie Sutter (1900-1900). Infant. Buried at the Westphelia Catholic Cemetery, TX. She was the only girl and lived from July 29- September 17, 1900. -Frank Joseph Sutter (1890-1956) and his brother, Joseph Sutter (1885-1935), were partners in the cotton ginning business for more than 15 years at Cego TX, in Falls County. The brothers traded the cotton gin for a nice sized farm at Krum, TX (Denton County). 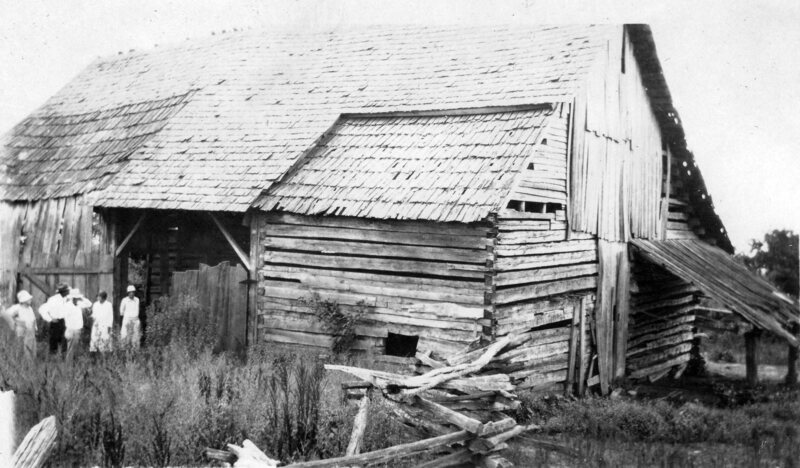 Soon after, Joseph died and Frank and his family moved to the farm in 1938. They lived there until 1950. 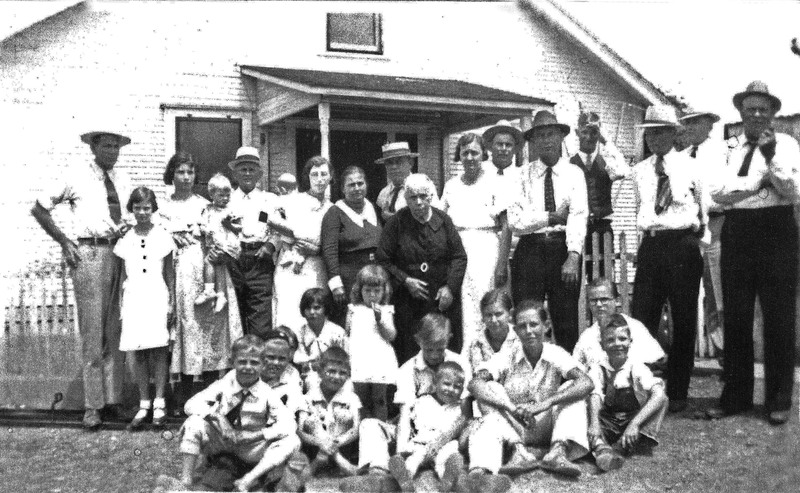 They sold the Krum farm and bought one at Pilot Point, TX, because they wanted to live near their daughter, Dorothy Sutter-Blackwelder. -Frank Joseph Sutler (1890-1956) was born in Westphela, TX (Falls County). His wife Mary Stitz Sutter (1893-1956) was born near Marlin, TX in Falls County. They married in the Sacred Heart Catholic church in Lott TX. They were married by the Reverend Joseph Klein. 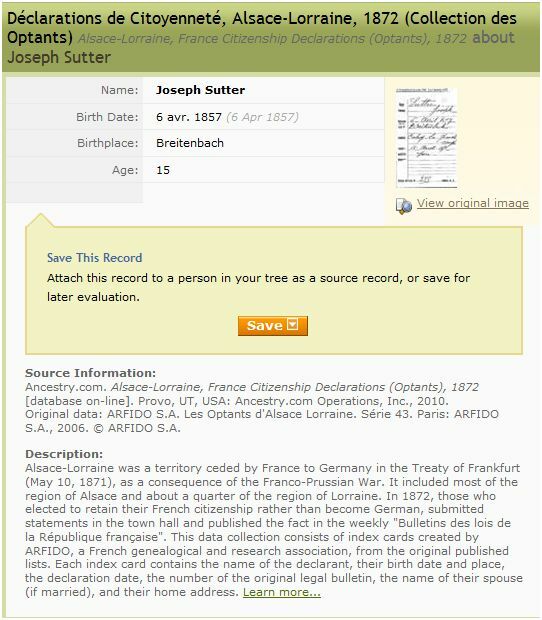 Walter Adolph Sutter was born in 1915 in Lott TX and died 19 April 2000 in San Antonio TX. He married Mary Ann Fickey (born 15 October 1914 in Tours TX, McLennon County, and died 20 February 2007 in San Antonio TX) on October 23, 1939 at the Immaculate Conception Catholic Church in Denton, TX. They have 2 children. Walter Adolph Junior born 11 October 1945 married Barbie Page who was born 17 December 1950. They have two children. Barbara Ann Sutter Denney (born 10 December 1950) and married Thomas Gilcrease Denney (born 2 January 1951 in San Antonio TX) in 1979. They have two children. Thomas Gilcrease Denney Junion was born 23 November 1983 in San Antonio TX. John Philips Denney was born 8 August 1988 in San Antonio TX. Dorothy Marie Sutter Blackwelder (1918-1 July 2008) was born in Lott, TX. She married Leonard Leo Blackwelder on November 10, 1941 at the Immaculate Conception Church in Denton, TX. Dorothy and Leonard had 3 children: Roger Leonard born on July 13, 1948, Leon Wayne born on December 18, 1952, and Glenn Warren born on March 8, 1954. They have 6 grandchildren. Leonard passed away January 20, 1989. Dorothy Mary Blackwelder, 89, passed away Tuesday July 1, 2008 at Fisher County Assisted Living. Services will be 10 a.m. Monday, July 7, 2008 at St. Thomas Catholic Church in Pilot Point under the direction of Huff-Slay Funeral Home in Pilot Point with burial in St. Thomas Cemetery. Rosary will be 7 p.m. Friday July 6, 2008 at the Huff-Slay Funeral Home. Dorothy will lie in state at Weathersbee-Ray Funeral Home in Rotan until 5 p.m. Friday. Dorothy was born August 17, 1918 in Lott, Texas to Frank Joseph and Mary Catherine (Stitz) Sutter. She graduated from Marlin High School in 1936 and moved to Krum three years later. She married Leonard Leo Blackwelder in 1941. They moved to Pilot Point where he farmed and she was a homemaker until retiring in 1978. Leonard passed away in 1989 and Dorothy moved to Liberty in 1992. She later moved to Sweetwater and finally Rotan in 2005. Dorothy loved gardening, working in her flowerbeds and quilting. She is preceded in death by her parents, husband, two brothers (Walter A. Sutter and Raymond Sutter). Survivors include three sons and daughters-in-law, Roger and Josie Blackwelder of Rotan, Leon and Cynthia Blackwelder of Liberty and Glenn and Belinda Blackwelder of Franklinton, LA; a sister-in-law, Elenora Kleypas and her husband Jim of Temple; and seven grandchildren and their spouses, Amy and Dominic LaValle, Laura and Laramie West, Adam and Robin Blackwelder, Nathan Blackwelder, Jason Blackwelder, Justin and DeVynna Blackwelder and Clay Blackwelder. Raymond Frank. Sutter (1920-1958) was born in Lott, TX. He died while on active duty in the U.S. Air Force at San Antonio, TX. He married Elenora Hollas on December 30, 1944 at St. Monica's Catholic Church in Cameron, TX. They had 3 children: Joyce Marie born December 25, 1945, Janice Ann born on March 12, 1947, and Paul Wayne born on August 10, 1953. He is buried at St. Monica's Catholic Cemetery in Cameron, TX. They have 5 grandchildren, and 7 great-grandchildren. Most probably, there was (and is) a settlement of German Sutters in Sweden; but originally, Sutters were of German descent. Some debate about whether Sutter is a German or Swedish name. Anna Feldhaus Sutter's family photo above. (Back row left to right) Will, Joe, Frank, John (Front row left to right) Heman, Alfonso, Henry, Aloysious. Most likely a Feldhaus visit to Texas based on the number of Sutters in this picture. Best guess on the date is around 1922 based on the age of the people in the picture. 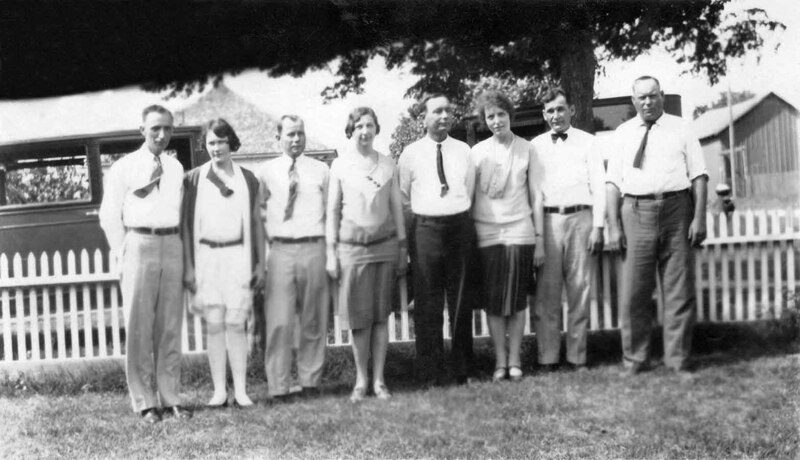 Left to right: Frank Sutter (Anna's son), Mary Ann Feldhaus, Anna Sutter, Cate Orth (Mary's daughter), Walter Sutter (Anna's son Frank's son), Alfonso Sutter (Anna's son), Joe Sutter (Anna's son), Charlie Feldhaus (Mary's son). The above picture was taken at the same time as the picture above it. Left to right: Anna Feldhaus Sutter, Frank Sutter, Joe Sutter, Mary Ann Feldhaus, Cate Feldhaus Orth. 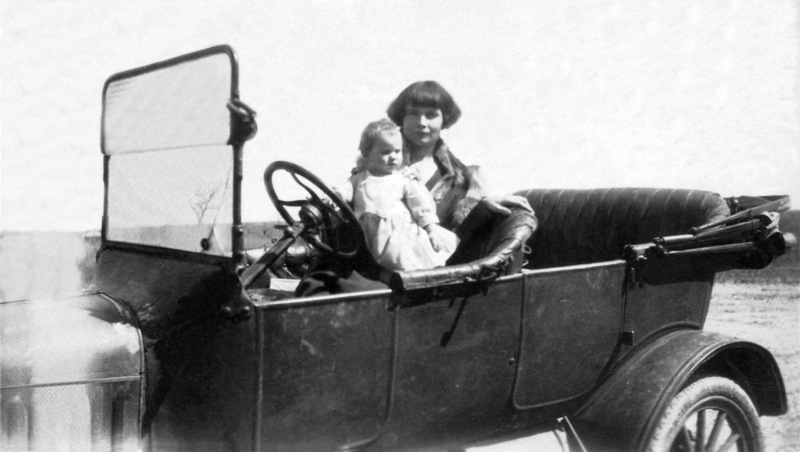 Anna Feldhaus Sutter and I believe her son Frank (or maybe Alfonso) with a car I believe is about a 1929 model, although I'm not sure what kind. It looks like a Hudson Essex model produced from 1929, 1930 and 1931. 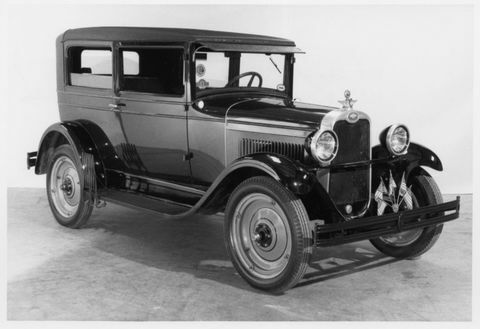 However, when compared to the 1928 Chevrolet they are in in the picture below, it appears to the the same car. 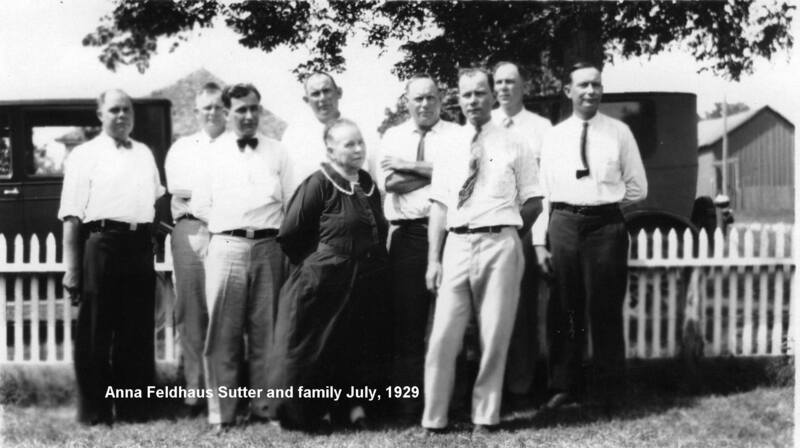 Anna Feldhaus Sutter's grandchildren, July 1929. I identified the children by their ages and heights and may not have them all correct. Back row left to right: Dorothy (Frank's daughter, age 11), Mary (Henry's daughter, age 6), Walter (Frank's son, age 14). 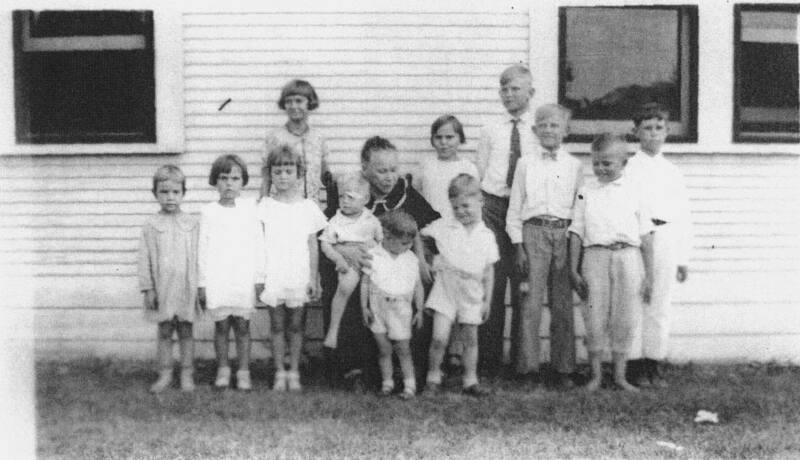 Front row left to right: Unknown girl, Unknown girl, Magdelene (John's daughter, age 4), Edward (Frank's son, age 2), William (Henry's son, age 3), Edward (John's son, age 3), Wilbert (John's son, age 10), Harvey (Henry's son, age 5), Raymond (Frank's son, age 9). 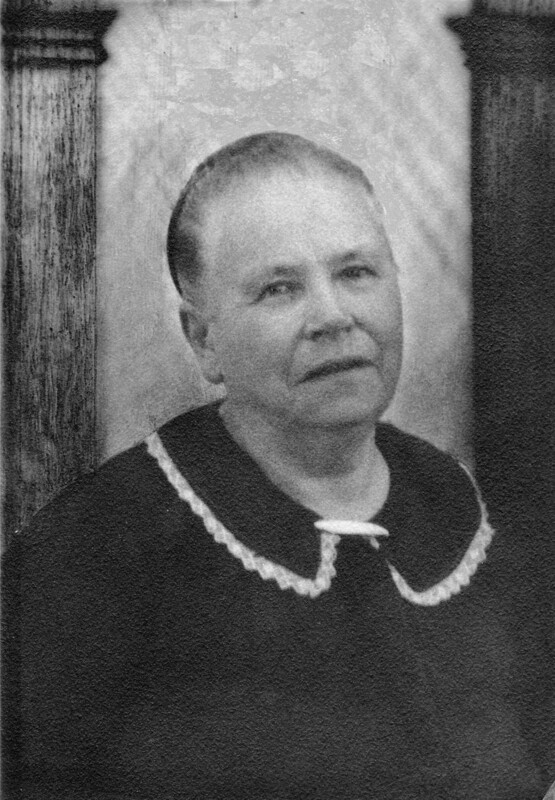 Anna Feldhaus Sutter on a visit to Lawrenceburg TN about 1930. Notice Henry Bernard Feldhaus, Jr. was still living. He died in 1931. 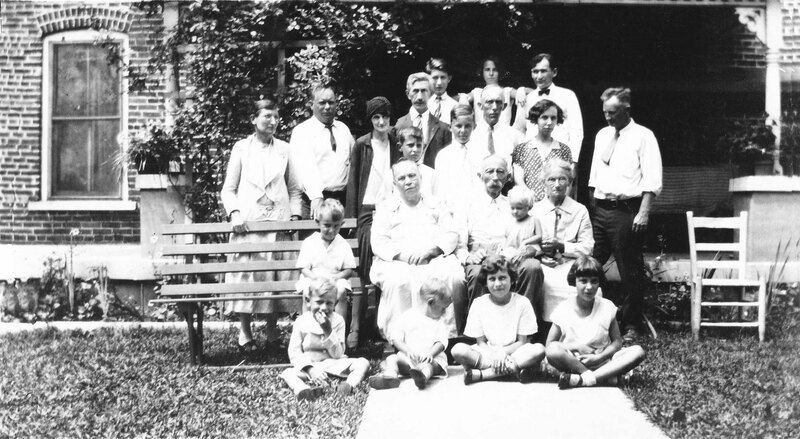 Back row: Cate Feldhaus Orth, Joe Sutter, Lena Boulie Feldhaus, Cate’s husband William Henry Orth, Cate and Joseph’s son Henry Orth, Ann and Joe Boulie’s daughter Sis, Alfonso Sutter. Next row: Cate and Joseph’s other sons Clarence and Charles Orth, Henry Feldhaus, Jr., Ann Feldhaus Boulie, and her husband Joe Boulie. Next row: Henry and Lena’s son Nookie Feldhaus, Annie Feldhaus Sutter, Henry Feldhaus, Sr. and his wife Mary Schneider Feldhaus with Henry and Lena’s daughter, either Pat or Catherine Feldhaus. 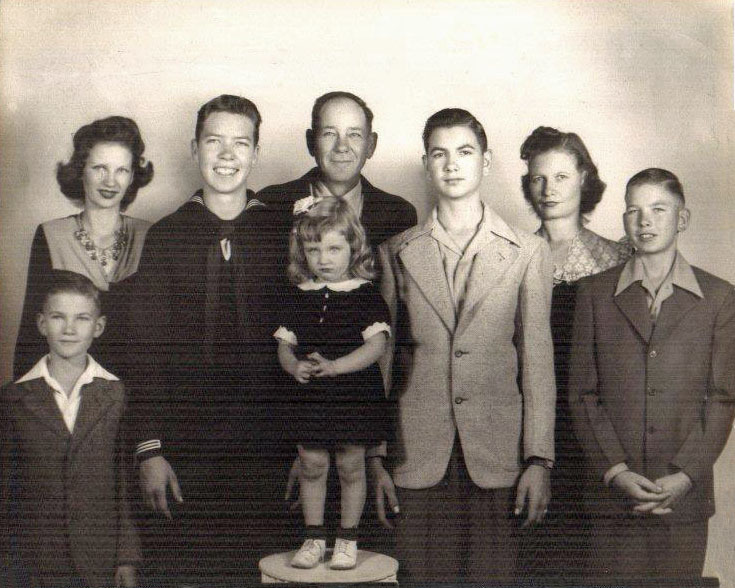 Front row: Ann and Joe Boulie’s son George Boulie, Henry and Lena’s son Joan Feldhaus, Cate and Joseph Orth’s daughter Josephine Orth, and Ann and Joe Boulie’s daughter Josephine Boulie. 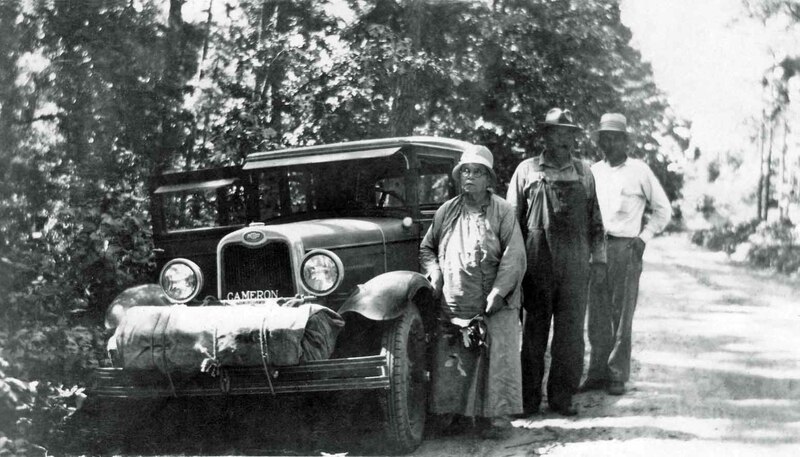 Anna appears to be on a camping trip with Frank and Joe in the picture above with them alongside their 1928 Chevrolet Sedan. 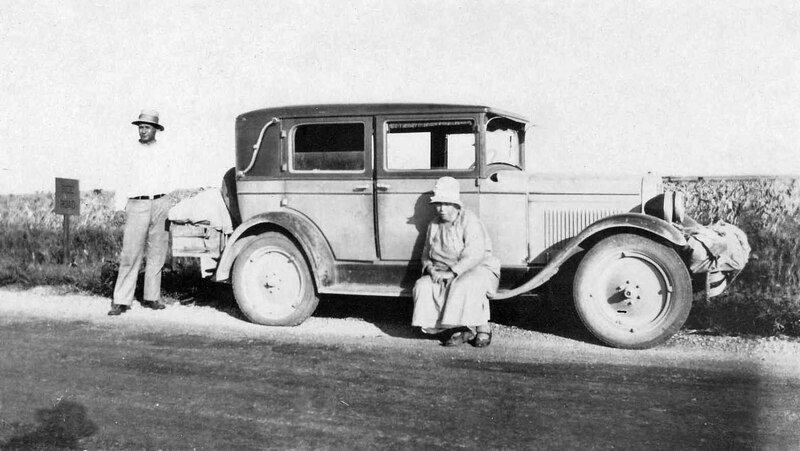 Stock photo of a 1928 Chevrolet appears at the right for comparison. Left to Right: Charlie Feldhaus, his wife Elizabeth Aiken, Aloysious Sutter, Clara Feldhaus, Will Sutter, Mary Feldhaus, Alfonso Sutter, and Joe Sutter. The cars in back could be as late as 1933. Charlie got married in 1935 so this is around that time. They may or may not be married, but probably were. I'm guessing they are in Texas for Anna's death in June of 1935 but could have been in Tennessee for Mary Schneider Feldhaus' death in September of 1934. Neither are in the picture which suggests they were both dead and that would put the group in Texas at Anna's death in June of 1935 while Joe was still living. He died in October of 1935. 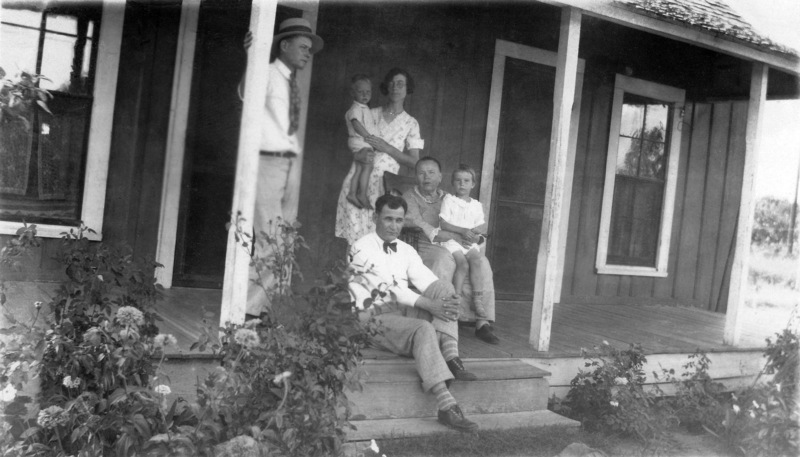 Anna is on the porch with John Sutter and his wife Bertha with Bertha holding Edward and Anna holding Magdalen and Alfonso Sutter sitting on the step with his usual bow tie. The 1930 census shows John married to Bertha with Wilbert 11, Magdalen 5 and Edward 3. Wilbert may be a school when this picture was taken. It looks like in this picture Edward is 2 and Magdalen 4 which would make this 1929. Anna and Joseph's son Henry Anton Suttor's wife Mary Barber Englert is the one in the 1923 picture above with their 3 year old son William (Will) Marvin Sutter. 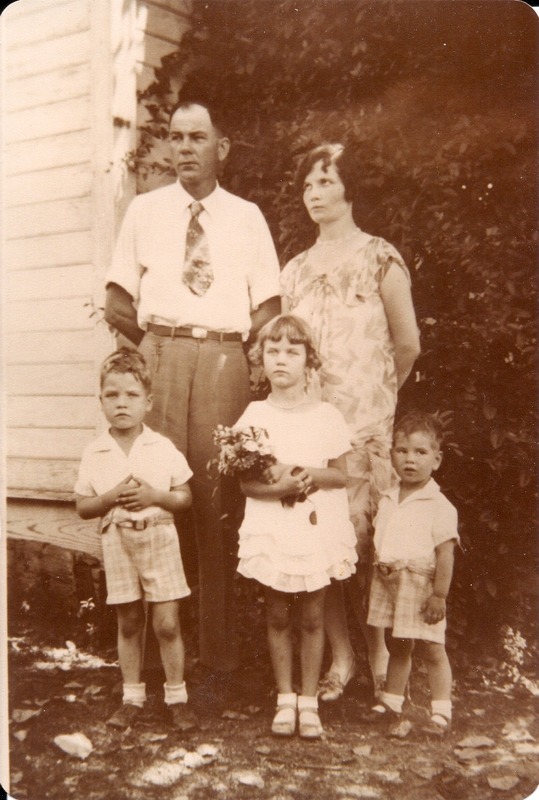 This is a picture of Joseph and Anna Sutter's son Henry Antone Sutter and his family about 1943. 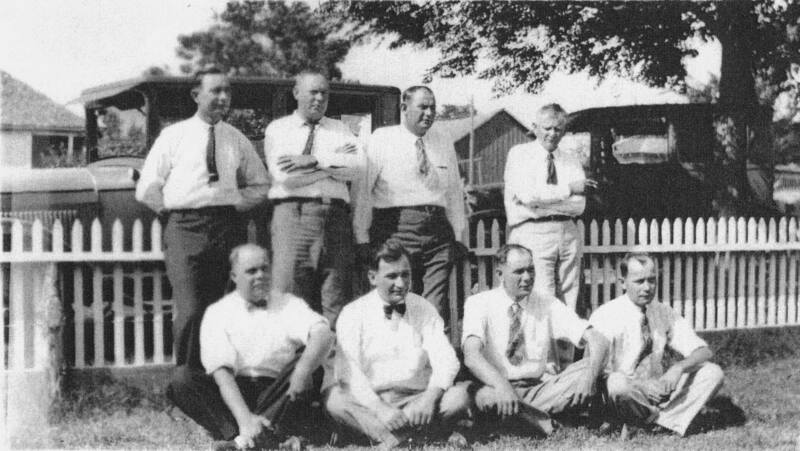 The back row from left to right are Mary Ruth, Harvey, Henry, William, Mary and Vernon. In the front row are Robert and Beatrice. One child, Betty Ann was born 31 August 1932 in Lott, TX and died 2 September 1937 in Lott, Tx. As of 2009 all are deceased except William, Robert and Beatrice. 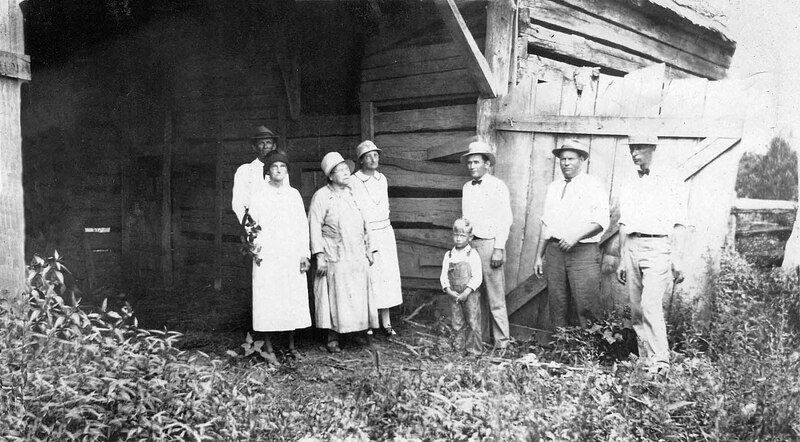 Henry Sutter and his wife Mary with Harvey, Mary Ruth, and Bill from left to right in the front. Not sure who the man in this picture is or what the device is being pulled by the team of mules. However, I decided to include the picture (from the Sutter family album) because it shows how life was lived at that time. This may be a land leveling device or it could be a road building machine. 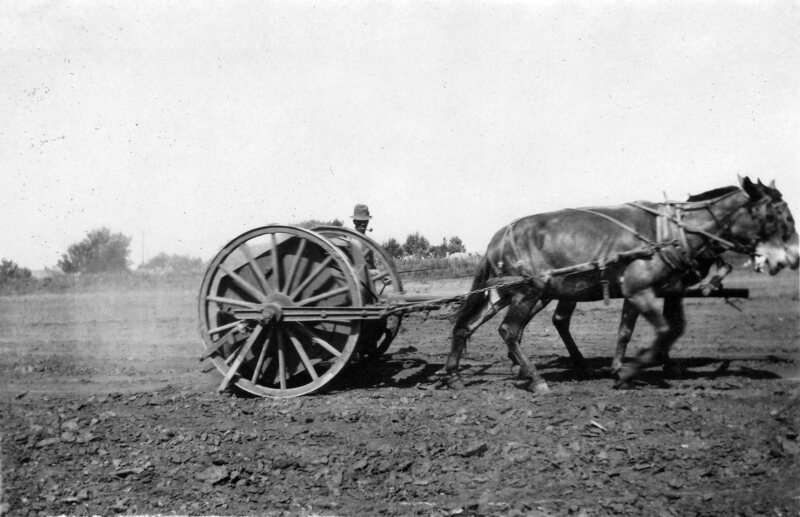 For sure the team of mules, and the driver, slept well after a day pulling this around. The pictures above and below also came from the Sutter album and represent life at that time and place. Not sure where this ferry was but it sure looks like Anna Sutter standing on the ferry in both photos. Notice in the picture below the three pulleys on the ferry holding the guy line that keeps the ferry from drifting down stream as it goes across the river. It's not clear if the ferry is powered or is being pulled back an forth with a cable.